On deck and ready for the spring lineup, New York Times bestselling author-illustrator Brian Lies’s ode to “batty” baseball fans. You think humans are the only ones who enjoy America’s national pastime? Grab your bat—the other kind—and your mitt, because it’s a whole new ballgame when evening falls and bats come fluttering from the rafters to watch their all-stars compete. Get set to be transported to the right-side-up and upside-down world of bats at play, as imagined and illustrated by best-selling author-illustrator Brian Lies. 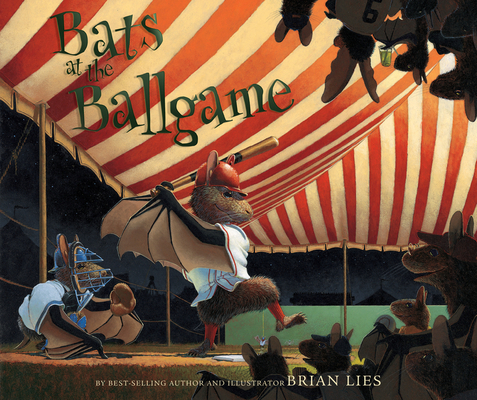 Brian Lies is the award-winning author-illustrator of the New York Times bestsellers Bats at the Beach, Bats at the Library, Bats at the Ballgame, and Bats in the Band. He has written and illustrated more than twenty books for children. Born in Princeton, New Jersey, Brian lives on the South Shore of Massachusetts with his family.